You might remember this when I painted a branch and hung some garland for Sebastian's first birthday as part of his decorations. Well I have decided to keep it up and reuse it for my advent calendar for the boys this year. 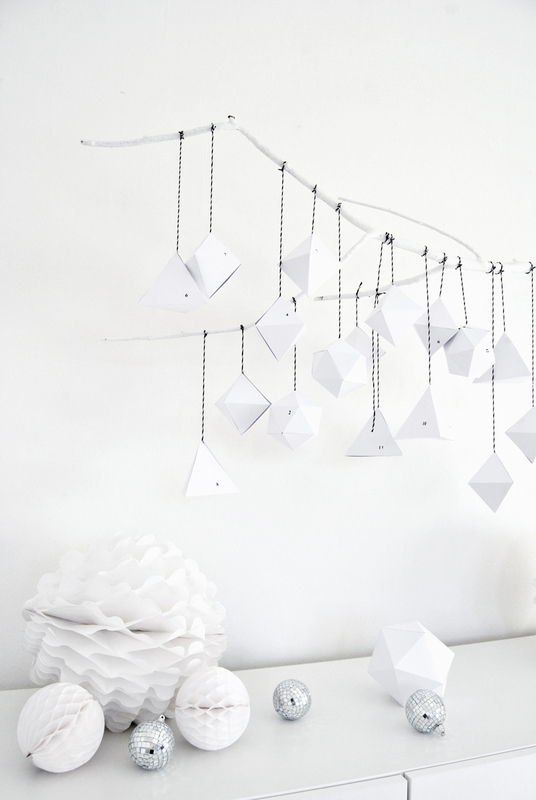 I am loving geo shapes just now and used this template to create all 24 shapes filling them with chocolate coins and small toys, hanging with some black and white baker twine onto the branch and used rub on numbers. i love this! great idea. and it totally matches your decor. no cheesy chocolate ones, here! this is wonderful!! simple and elegant. Beautiful! I love it in all whiite! You have such an amazing eye! This is all sorts of fantastic! It's also perfect to countdown to any other occasion... I love white! I love those cupboards, where are they from? So beautiful. Your photography of white spaces and objects is amazing! Jennifer, this stuff blows my mind, those geometric packages!! sooo so lovely! Such a beautiful advent calendar!Happy contdown!! Looks wonderful. I love it very much. So simple and elegant. Just positively gorgeous! I love your blog! The pictures are so elegant. Thank you! I love this idea! We never did advent calendars growing up (and still don't - I've never had one), but I like this purely from a decorative stand point. It's beautiful!